A Web App (capital “W,” capital “A”) is technically a web site, but it can be saved to the home screen and subsequently opened as if it were a native app. A Web App allows a publisher to bypass the app store submission and approval process, as well as the recurring developer account fee (Apple’s start at $99/year). This is great for publications that are rushed (and can’t wait for approval), or don’t comply with app store guidelines (such as internal documents or marketing materials). in5 allows you to export an iPad, iPhone, or Android Web App with a single option. Once the content is exported and uploaded to a web server, the page automatically detects the device, and whether the user is running from the web or as a Web App. If the user is running your site on the web (on the desired device), they’re prompted with instructions (2-clicks) to install the app to their home screen. Once on the home screen, your site functions like an app. Plans start as low as $3-$5/month. Use a reputable host like Lunarpages, Arvixe, Blue Host, or another well-reviewed provider. Learn more about using a web server. You can also create your own Web App from scratch. It's a surprisingly simple conversion from a web page. 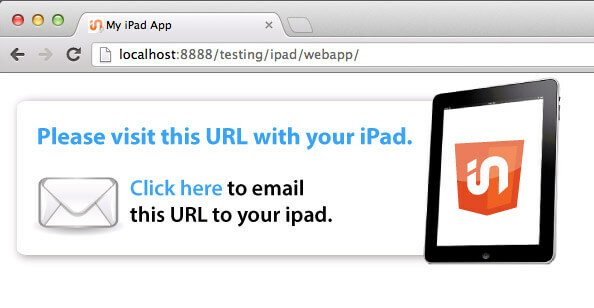 Check out Chris Converse's Create an iPad Web App course on Lynda.com. Questions about in5 or Web Apps? Let us know.